The different regions of Honduras—including the hot and humid Caribbean lowlands, the hot but dryer Pacific lowlands and the more moderate and dry interior highlands—allow for great biodiversity, especially when it comes to spiders. Honduras is home to species of orb weavers, wolf spiders, jumping spiders, huntsman spiders and tarantulas. This spider is easy to spot because of its distinctive oblong body and bright markings. Its shape and colors vary by region, and it is found across a wide range of habitats from the southern United States to Central America. Most spiders across these regions have white spots on their underside, but their spines and back may be yellow, red or orange. Females can typically grow to between .2 and .4 inches long, while males grow to be between .08 and .1 inches. They usually live around woods and shrubs. Although their spines can puncture human skin, they are not poisonous. Common in North America, the thin-legged wolf spider is also found in Honduras. It can live in both dry open woods and wet grounds near a water source. When it’s not hunting, it often hides under rocks or in long grass. It usually doesn’t grow to be more than a quarter of an inch long and can be brown, black, or tan with thin stripes running along its body. While a wolf spider bite is not deadly, it can irritate human skin and potentially cause legions. 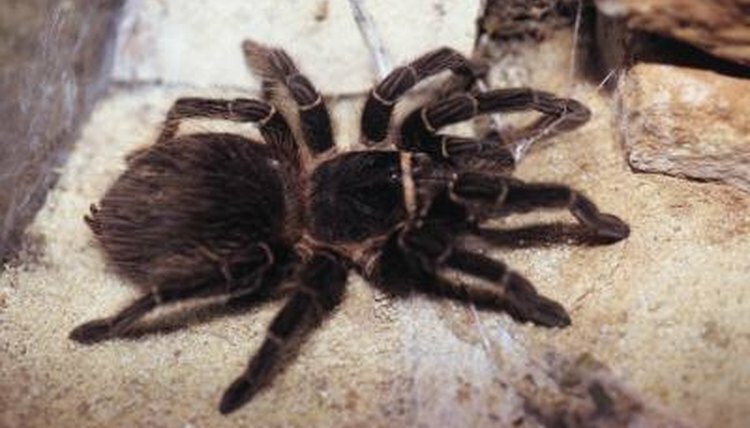 While tarantulas are the biggest spider found in Honduras, they are not particularly dangerous to humans. Some people even keep them as pets. The hair on their body gives them a “fuzzy” look, and they are usually dark brown with lighter brown or orange highlights. They are found in the rainforests of Honduras and Costa Rica and prefer living in burrows in a warm environment. They are frequently bred in captivity but are becoming fairly scarce in the wild due to a loss of habitat. Although it is not technically a spider, the scorpion, a fellow arachnid, is also common in Honduras. Nine different species have been identified across Honduras. Although they typically live around rocks, sand and trees, they are adaptable and can live in many different climates. All species of scorpions are dangerous, and although not all stings are fatal, it is important to get to a doctor if you are stung by a scorpion while traveling in Honduras.